More and more of us are podcasting or Internet broadcasting, and this affordable dedicated mixer can make these tasks easier. With so many software amp simulators to choose from, how do you know which one is right for you? Here’s our selection of current options, with links to the SOS review where available. 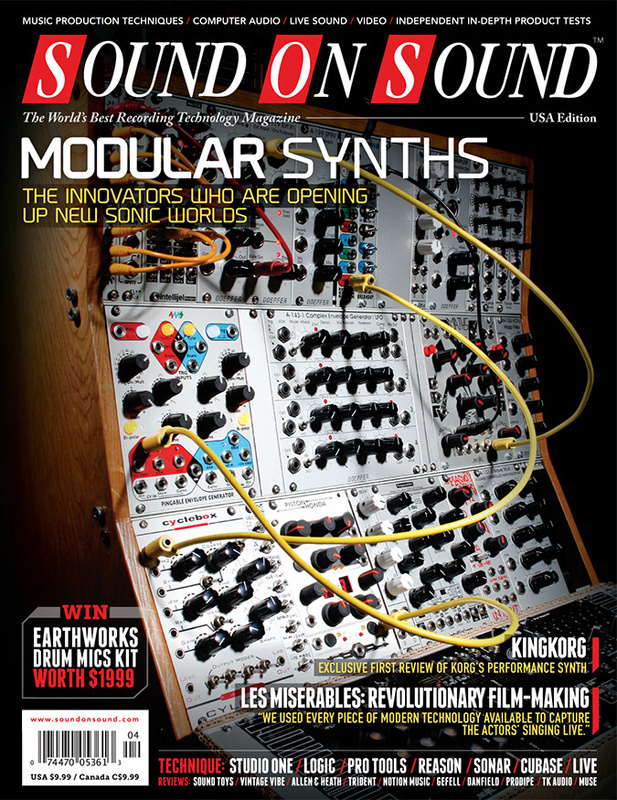 This month we look at the PPG WaveMapper, Touch Press, 'The Orchestra', JamUp Pro and the IpTouch Logic controller App. ART's Tube MP/C combines a hybrid 12AX7 (ECC83) valve preamp section with the company's 'Vactrol' optical compressor, and the whole thing is all about tonal character. The Little Chopper is a boutique, 7W amp head, with a variable power control which allows the user to achieve their desired sound at manageable levels. Not every mic on stage has to be one of the usual suspects, as Audio-Technica prove with these two dynamic vocal mics. With an emphasis on clarity and speed, and a not insignificant price tag, this preamp/compressor combo promises a lot. Does it deliver? This month we feature: Animal Language, Arabella, Bark Prelude, Bright Lights, Patawave Sound Project, Pierre Vincent and Steve Burgan. This month we review the M-RGT Ambitron and Universal Audio, Precision K-Ambience Recovery Tool. An unconventional Fender Rhodes Stage 73 Mk1 electric piano Sample Library. Sound Toys turn back the clock to bring some ’60s grit into your DAW. Bedroom-based boffins the world over are manufacturing increasingly bizarre and esoteric synth modules. Come with us as we step away from the modular mainstream and take a look at some of the more eccentric Eurorack synth modules this weird world has to offer. For decades, Trident’s Series 80 consoles have graced world-class recording facilities. The new Series 80B dual channel strip makes this classic sound available with a much smaller footprint — and cost. Now you can get your music to the outside world without ever leaving Pro Tools! Cubase 7’s Mix Console is far more capable than its predecessors, but can be daunting to newcomers. We show you how to configure it to your needs. Our tame engineer shows that you can craft a great mix even using compression in moderation, and that a little editing up front can make the job of mixing a whole lot easier. Logic’s Ultrabeat is more than just a drum machine — so get creative with it and ‘glitch up’ your dance tracks! When you make recordings designed to show off your hi-fi systems, they had better be good! It’s no accident that Philip Hobbs of Linn is one of the UK’s leading classical engineers and producers. Take a walk on the wide side with these Studio One stereo guitar techniques. We examine the production of some recent hits from PSY, Mumford & Sons, Devlin and go back to 1996 classic track 'Killing Me Softy' by The Fugees. Try some guitar-amp modelling with Live, a couple of plug-ins and a bit of know-how. Editor In Chief Paul White asks "Should Plug-In 'vintage effects' offer something different?" Forty years after its original release, Mike Oldfield tells us the story of recording his hugely successful debut album, Tubular Bells. Why are we lusting after vintage gear? Producer Simon Gogerly talks about the trend of worshipping vintage studio gear. In his quest for authenticity, director Tom Hooper drove his Les Misérables technical crew to completely reinvent film soundtrack recording. With lack of driver support for so much perfectly usable hardware, can anything be done to counter built-in obsolescence? Q. Can I use the front and rear sides of a Blumlein array simultaneously? Read more about Q. Can I use the front and rear sides of a Blumlein array simultaneously? Q. Can you explain digital clocking? Read more about Q. Can you explain digital clocking? Q. What can I do to make my mixes sound more like commercial records? Read more about Q. What can I do to make my mixes sound more like commercial records? Q. Which should I check first: monitors or FOH? Read more about Q. Which should I check first: monitors or FOH? We visit this penthouse studio overlooking Time Square, New York. Stupidity is annoying, but at least it’s only a distraction. Isn’t it? Media content for the April 2013 issue.